Free Computer Ticks We are always Happy to Help You. 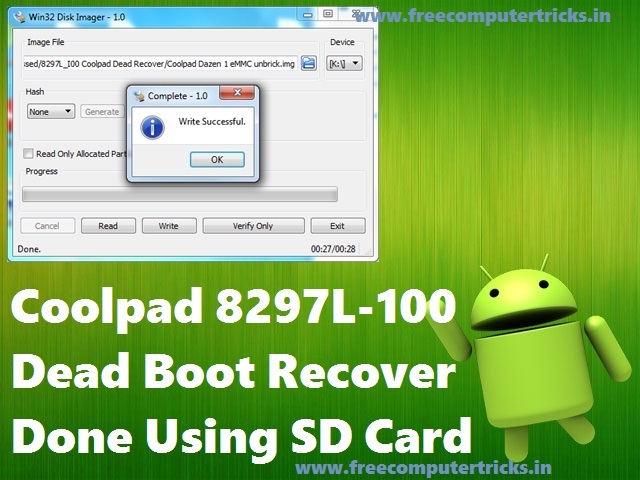 In this tutorial you will know how to recover the Coolpad Dazen 8297l-100 or 8297l-i00 using SD card. Make the mcroSD card bootable with recovery file and then you can flash the phone using YGDP flash tool. You can also recover the dead Coolpad Android smart phone using QFIL flash tool. If the Coolpad phone dead after flash or dead after format then this topic will help you to recover the dead Coolpad Dazen 1 Android version 4.4 KitKat smartphone. What you have to do is just download a small EMMC boot image file and make the SD card bootable then write the boot image file, then insert the SD card in the phone and hold the Volume Key then connect USB cable to Computer, now the phone will boot up with download mode. To dead recover your phone you need to download Win32 Disk Imager and Coolpad Dazen 1 EMMC Unbrick .img file. If the phone is not switched on and it's completely bricked then this process with defiantly help your to get the phone back to normal condition. Download links for Bootable SD card maker tool and recovery boot disk image file is given below. First you need to create a bootable SD card or Memory card using the recovery eMMC disk image to boot the phone into fastboot mode or download mode. So let's create a bootable SD card for your Coolpad Phone, please follow the below steps. You need a SD Card at least 2 GB and Card Reader. Insert the Memory Card in card reader and connect to Computer. Now open Win32 Disk Imager and choose the eMMC .img file. Select your SD card Drive letter (Important). Now Click on Write and when you see "Write Successful" Click OK then Exit. Now insert the SD card in phone and press Volume Up then connect USB cable. Now the phone will boot into fastboot download mode now flash the phone using YGDP flash Tool. Now you have successfully created a bootable SD card which boot the dead Coolpad Dazen 1 phone into download mode. After creating this bootable memory card follow the below tutorials to flash and unbrick the Coolpad Android smartphone. HOW TO FLASH COOLPAD DAZEN 1 8297L-100 WITH YGDP TOOL? HOW TO RECOVER DEAD COOLPAD 8297L-I00 USING QFIL FLASH TOOL?